“Brave Girls Want” is the new campaign from The Brave Girls Alliance, and it gives a chance to campaigners, schools, children and the public to share their tweets on girl empowerment with an audience of millions. The plan is to infiltrate the media by renting a billboard in Times Square, New York. For a few minutes an hour over the course of seven days, positive, inspiring and constructive tweets and messages will be shown in a location that is the world’s number one global branding location and home to many media and toy companies. The Brave Girls need funds to make this happen; supporters who donate $25 or more get the opportunity to have their opinion showcased on Times Square. Let Toys Be Toys is a member of the Brave Girls Alliance, an international group of grassroots organisations, parents, teachers, activists, businesses, experts and artists who have come together to challenge the current representation of girls in retail, advertising and the media. The Times Square take over is just one of many ways the alliance is working to create products and media representation which will promote a healthy girlhood. One of the core values of the Brave Girls Alliance is the belief that “girls thrive when they can see the widest possible variety of ‘ways to be a girl'”. This cannot happen when retailers market certain toys as being “for boys” or “for girls”, especially when the decisions about which toys go where are based on stereotypes. What do “Brave Girls Want”? 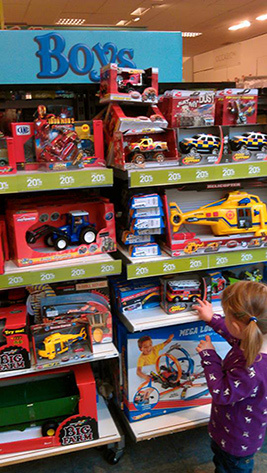 To achieve this, Let Toys Be Toys asks retailers to commit to stop using gender stereotypes in their marketing of toys. We want them to cease labelling toys as for “girls” or “boys”, and to instead market toys in a gender inclusive way that supports equality for all children. Imagery in marketing also has an important part to play: we’ve found that it’s very common for toy retailers to portray girls as uniformly pretty, passive and completely inactive for example, whereas boys are portrayed doing fun, exciting, high energy, active stuff. This polarising imagery does not reflect our experience of childhood in the real world, and we love the idea of the Brave Girls Want campaign redressing the balance for a time, and challenging people in Times Square and beyond to question the way girls are presented in the media. 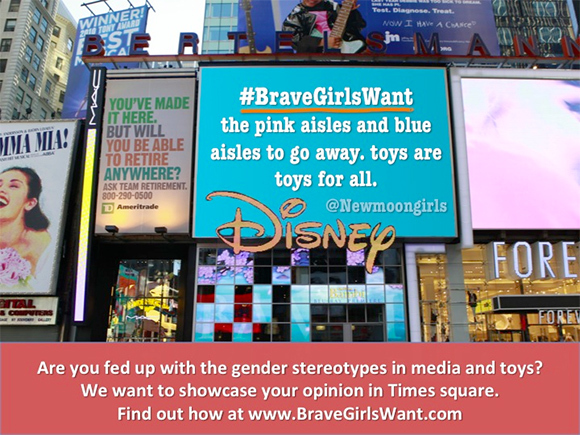 So, what do brave girls want from toys? We say, choice! Whether it’s dolls houses, science kits, cars or colouring books. They want the same things “brave boys” want, to be a child and to have genuine choices that are not influenced by signs, colours or pictures telling them that girls and boys must like different things. 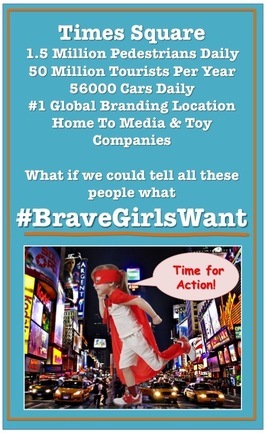 For more information on how to support to the Brave Girls Want campaign please visit www.bravegirlswant.com and follow the #BraveGirlsWant hashtag on Twitter. The Brave Girls Alliance is seeking funds to make this action happen. They’ve already raised over a third of their target, but there’s still a way to go – and as they’re using crowd sourcing to fund this, if they don’t reach the target by 11th September they’ll get nothing at all. You can donate, and find out how to submit your tweet at www.indiegogo.com. 1.5 million people walk past Times Square every day, what would you say to them? Brave Girls Want – you to get involved!